My first modem back in the 1980s was a pokey 300 baud modem, which I used to war dial into my high school's computer system. No, I didn't change my grades. I recall connecting to my dad's SNET (now SBC) phone company's servers using a modem list that my dad gave me. Talk about corrupting the morals of a minor! I wasn't a hacker per se. Just a curious teenager checking out remote computer systems. My parents bought me a 1200 baud modem for Christmas which I thought made the text fly on my screen. 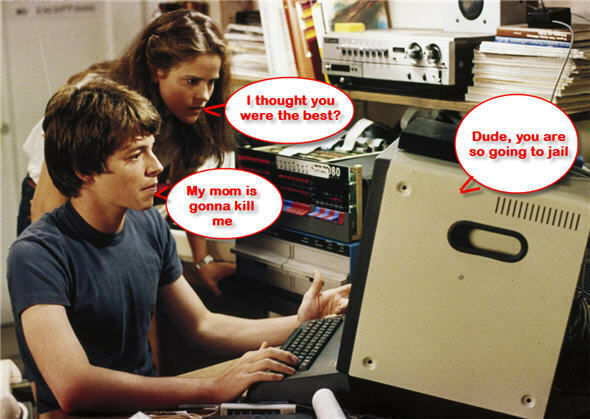 When I then upgraded to a 2400 baud modem, I thought life was great. I was logging onto BBS (Bulletin Board Systems) and playing online games, including Risk, Trade Wars, and more using colored ASCII text/characters for graphics. I also remember in the 1980s playing with PC Pursuit which leveraged the Telenet network. Telenet was a packet switched network started in 1974. It was the first publicly available commercial packet-switched network service. With a flat-monthly fee, PC Pursuit users could dial into the Telenet's packet-switched network in one city, then dial out on the modems in another city to access bulletin board systems and other services, thus avoiding long-distance charges. Sound familiar? PC Pursuit was a forerunner of Voice over IP services. Who knew I was playing with something in my teenage years that would later evolve into VoIP technology and indeed my career in VoIP.